You have been asked by a youth group, church group, or school to run a youth basketball clinic for your area youth. Or you are a high school coach wanting to build his/her program by starting "from the ground up" with your younger players. For this discussion, let's assume the kids have had some basic level instruction and are in the 12-17 year old age range. For even younger kids, see "Coaching Youth Basketball" (go to the bottom of the page). Hopefully you will be able to break it down into various age groups and will have several sessions with each group (maybe a week long clinic). Your focus should be teaching the basic fundamentals, while making it fun for them. Below I have listed the fundamental skills you should teach, and some drills for each fundamental. Vary these drills from day to day, to maintain player interest and for more fun. You will need space, a large enough gym (full-court) for the players to spread out, and hopefully several side baskets. You must have enough basketballs so that each player will have a ball (ball-handling and dribbling drills). Make sure younger players and girls use the 28.5 size ball. Have practice jerseys for scrimmaging. Enlist the help of some assistants. If you can get them, some of your local varsity players (both boys and girls) can be very helpful in demonstrating and helping with the various drills… e.g. dribbling and ball-handling drills). And the younger players oftentimes look up to the varsity players as their heroes… so get good role models. You should do the ball handling and dribbling drills for 20 minutes at the start of each session. Teach the concepts of close-out, on-ball, deny and helpside defense. No zones for now. ... box-out, grab the rebound, chin it, and outlet pass. Let them scrimmage some at the end of each session, just for fun! 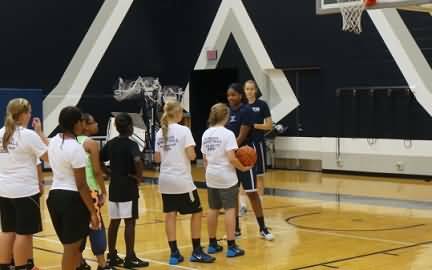 Give positive, constructive instruction as they play. When you notice they are tired, have them stop and make a few suggestions, and then resume play. OK, there's a lot of stuff to look at. But don't try to do too much at once. Ideally, you will have several sessions for each group, and you can work these various things into your plan. I think the kids will enjoy it more if you vary the drills. But some drills (the basic ball-handling and dribbling drills should be done each time at the start of the practice). Be sure to take a look at the video clips pertaining to the drills and fundamentals listed above.